An experimental flu vaccine patch with dissolving microneedles appears safe and effective, a preliminary study shows. The patch has 100 solid, water-soluble and painless microneedles that are just long enough to penetrate the skin. Researchers say it could offer a pain-free and more convenient alternative to flu shots. "This bandage-strip sized patch of painless and dissolvable needles can transform how we get vaccinated," said Dr. Roderic Pettigrew, director of the U.S. National Institute of Biomedical Imaging and Bioengineering, which funded the study. 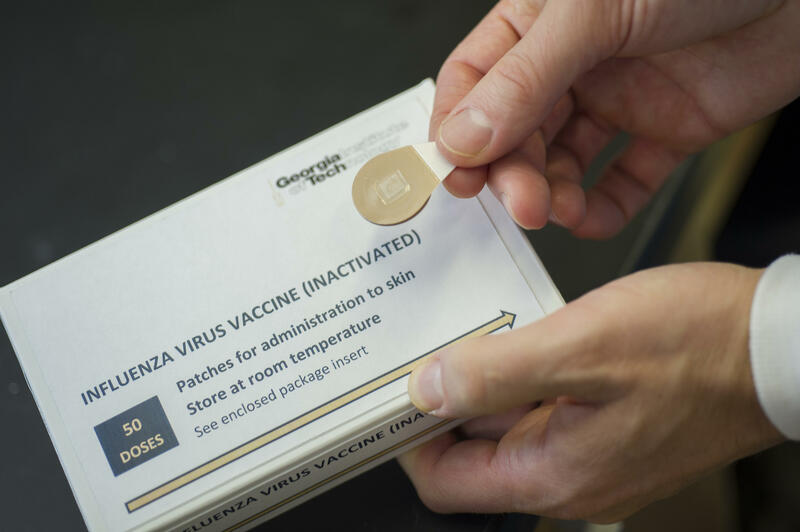 "A particularly attractive feature is that this vaccination patch could be delivered in the mail and self-administered. In addition, this technology holds promise for delivering other vaccines in the future," he said in an institute news release. The study of 100 adults found that the patch triggered a strong immune response and did not cause any serious side effects. At most, some patients developed local skin reactions to the patches, which involved faint redness and mild itching that lasted two to three days. The flu vaccine is released by the microneedles, which dissolve within a few minutes. The patch is then peeled off and thrown away. Researchers at Georgia Institute of Technology and Emory University led the study. The results were published online June 27 in The Lancet. These early results "suggest the emergence of a promising new option for seasonal vaccination," Drs. Katja Hoschler and Maria Zambon wrote in an accompanying editorial. They are with Public Health England's National Infections Service. The "more exciting features" of the microneedle patch include its low cost, safety, storage convenience and durability, they said. "Microneedle patches have the potential to become ideal candidates for vaccination programs, not only in poorly resourced settings, but also for individuals who currently prefer not to get vaccinated," the editorialists wrote. "The flu microneedle patch is easy to use -- it can be self-administered and, like other medication patches, it is well absorbed through the skin," said Dr. Len Horovitz, a pulmonary specialist at Lenox Hill Hospital in New York City. "This development eliminates the need for intramuscular injection [a flu shot] by a health care professional," he added. Also, "this patch does not need to be refrigerated -- it has a long shelf life," Horovitz noted. "Standard vaccines can loose potency if left out of refrigeration repeatedly, as occurs in most settings."